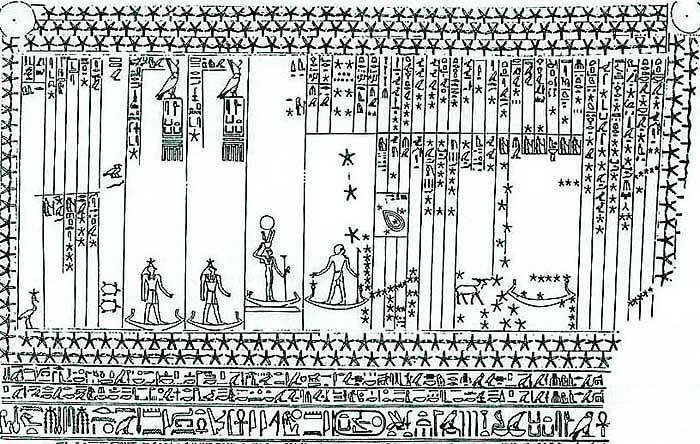 The following, a presentation of discovered data in the world's oldest star map, which is of special importance to Egyptology, ancient history and astronomy. This has a great influence concerning studies of chronology and the related culture and the science on Egypt's 18th dynasty and Ancient Near East as well. The presented new-orientating information concerns the hitherto 'hidden' data now being revealed by a thorough examination of the most unique Egyptian celestial depiction - the world's oldest star map. It is decorating a ceiling in Senmut (Senenmut), the vizier's 3500-year-old tomb at Thebes (Luxor). For the first time, the star map has been decoded, thoroughly, for its content of precise dating-information. These results have been published by Ove von Spaeth in his treatise on "Dating the Oldest Egyptian Star Map", 2000 (cf. below). A summary (and a press release) of the actual scientific publication of these new data and their analysis - together with the subsequent discussions of the results (cf. the FAQ-section) - are here, and on the next pages, presented at your disposal as information, material for inter-disciplinary purposes, libraries, data bases, and otherwise. The said treatise was published in July-August 2000 in Centaurus International Magazine of the History of Mathematics, Science, and Technology, Vol. 42;3, 2000, pp.159-179. Centaurus Magazine is published by Blackwell-Munksgaard International Publishers, Global. Besides the scientific libraries, the treatise can be retrieved (as No ISSN 0008-8984) by the normal public databases of scientific articles. Survey of the sky in May 1534 BC (Gregorian calendar style, and please notice: the years are listed as according to traditional, normal procedure for historians, i.e. without the "0 year") - when the planets were grouping around Sirius. (Questions regarding the accuracy of the calculations? 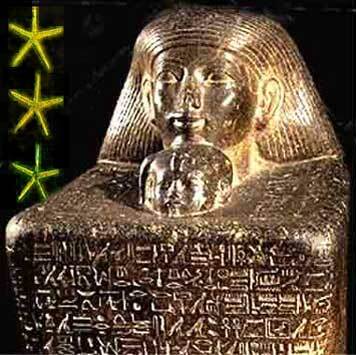 - please study FAQ: Dating the Oldest Egyptian Star Map). The planets are here depicted on a straight line, although in reality they are placed at various latitudes. However, it does not influence the exactitude of the analysis which defines the celestial location of the major conjunction found in the Senmut star map as pointing at or identifying precisely the calculated date: May 1534 BC. "... Regarding Ove von Spaeth's momentous, new-orientating treatise on "Dating the Oldest Egyptian Star Map", which was published in "Centaurus International Magazine on The History of Mathematics, Science, and Technology" (2000, Vol. 42:3, pp. 159-179): - a scientific pioneering work which has gained sustained admiration and respect internationally for its non-traditional observations and for finding solutions to difficult problems of key importance to ancient Egyptian astronomy and the chronological perspectives. In addition, the actual findings have furthered research on rendering more accurate the dating of Moses' historical period …"
Apart from the analysis of the Ancient Egyptian star map some more perspectives of interest have appeared. In the research - totally separated from other purposes - on the dating of the star map, executed by Ove von Spaeth, the results as published in the "Centaurus International Magazine of the History of Mathematics, Science, and Technology" contain further valuable information and aspects. The exact astronomical dating of the Senmut star map presents the improvements of the chronology (most needed) of not least its conneting 18th dynasty as a very important period of ancient history. The fixation of the date of the specific arrangement of the celestial bodies on the map has also contributed to the new-orientating research on the historical Moses by Ove von Spaeth (more information, cf. : "On History" and "Brief view"). Concerning the Centaurus-publisher's part of copyright to publish the treatise in question, this limitation has most kindly been excluded for the benefit of, in other connections, presenting the text (the originally separated analysis) as an addendum to the author's ancient history Moses-research. With this admission to its content the treatise was also published as an appendix to the Volume 2 of Ove von Spaeth's book-series on Moses and his era. Centaurus, History of Mathematics, Science, & Tech.